My guilty pleasure is clothes. I haven’t actually indulged in clothes in a very long time, however, last week I just couldn’t bear it any longer and I splashed out in Topshop. No regrets. I bought some summer numbers as I basically have no summer clothes due to two years worth of summer placements meaning no sun for me. BUT this summer so far has been so sunny and hot *touch wood* that I just had to refresh my wardrobe. I got two plain t-shirts and one slogan t-shirt, because a lot of my trousers and skirts that I have are patterned and you can’t go wrong with a plain tee. One maxi for the cooler days and one mini for the hotter days. Both of these skirt fit really nicely. The ruffles on skirt on the bottom picture are very flattering and are slimming on the legs which is always a bonus. I would say though that this skirt is quite small fitting and it is very short size wise. I got a pair of the adidas leggings because they are a good twist on the classic plain black leggings. The material is also fairly sturdy, so hopefully they won’t start to go saggy which tends to happen to all my leggings. I LOVE the printed trousers that I found in the sale section. At first I was wasn’t sure about the cut but when I tried them on I had to get them. They are slightly flared and fit snuggly around the thigh and bottom area – very flattering. Whilst staying with my granny on the North Cost of Ireland, I made a friend…. in the form of a stray cat. She was incredibly timid and so thin so I began to feed her whenever I saw her sitting on grannies wall. She really didn’t like me at first, hissing whenever I came within a couple of meters from her. Granny and I named her Alley, due to her being stray (think Alley cats). She had a bit of hair missing from her head and her ear was split, I presume from fighting. She had the biggest green eyes and longest whiskers I had ever seen on a cat. She was beautiful. It took a lot of perseverance and a lot of time but finally I was able to stroke her and eventually pick her up. I decided to find out where she was living and in between two walls she had stashed away three little kittens! Alley was a new mother! After finding this out I made sure she was getting enough food for her to put on a bit of weight which hopefully then would in turn help Alley support the kittens. By the time I was leaving my granny house to travel back to Edinburgh, Alley would greet you as you came out of the door, rubbing her little head on your legs. She became incredibly friendly and tame. On my final day Alley was even purring which I hadn’t heard her do. I was devastated to leave her but I know my granny will be taking great care of Alley and her kittens. I will need to go over and visit her soon (hopefully) before the kittens grow up. I mean the title of this post is slightly misleading as I was only in Belfast for 1 half day really. However I did manage to squeeze in a couple of activities before heading to the North coast to see my gran. The city bus tour was worthwhile as it took you all around Belfast. If you don’t have much time it is a really good whistlestop tour. For students I think it was around £10 but it lasts an hour and a half. Next stop was a bar called Kelly’s Cellars. 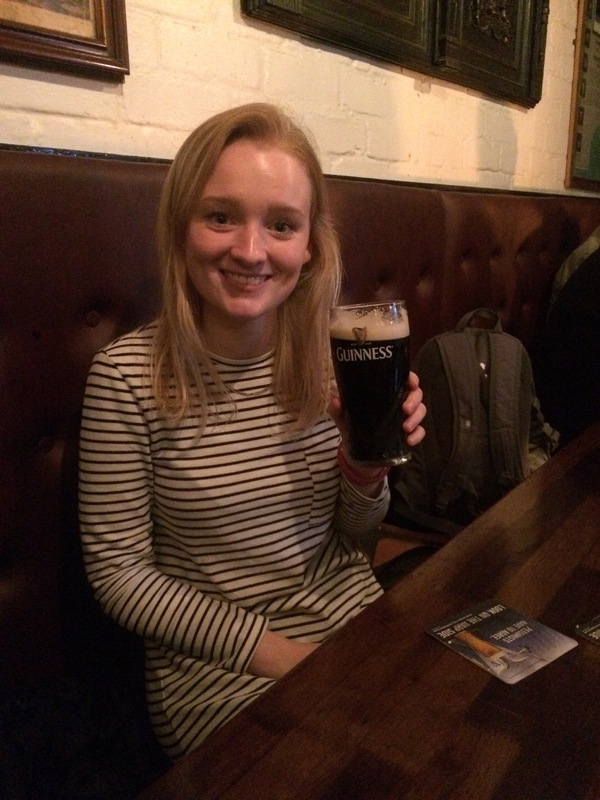 Because you can’t go to Ireland and not have a pint of Guinness. It was a really quaint bar with an open fire and things hanging from the ceiling. Also not too pricey which is always a bonus. Something which I really wanted to do but didn’t have time was a tour of the murals. 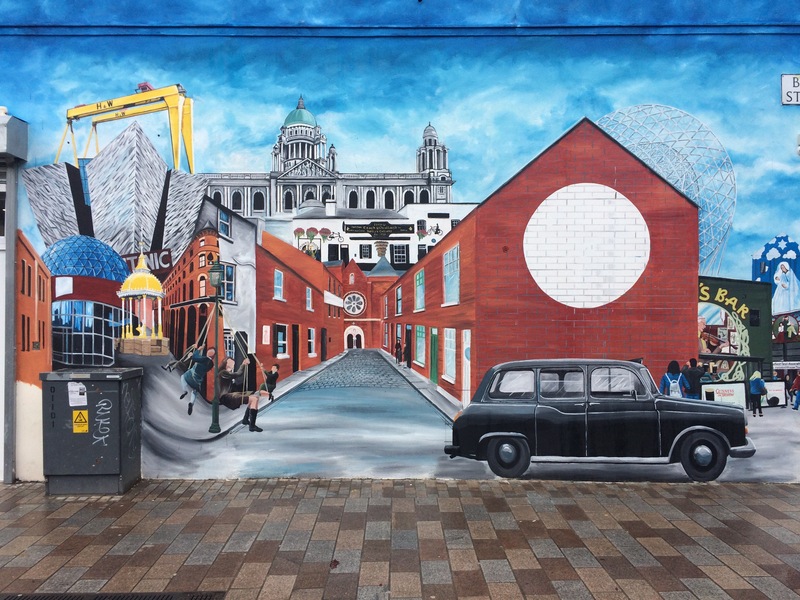 The murals do tell a storey of the troubled past which I find all very interesting but the weather was bad and time was tight but on my next visit it’s a must. 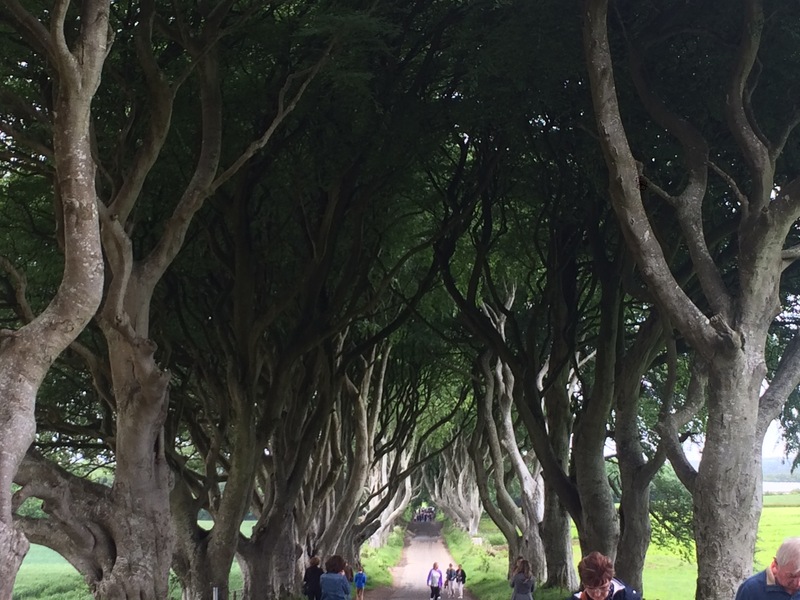 Then it was up to the North Coast where the first stop was the dark hedges made famous by Game of Thrones. To be brutally honest it’s not really worth the hype. I mean don’t get me wrong it’s a nice looking road of trees but it’s not worth the bus loads of tourists that come from all over to see it. 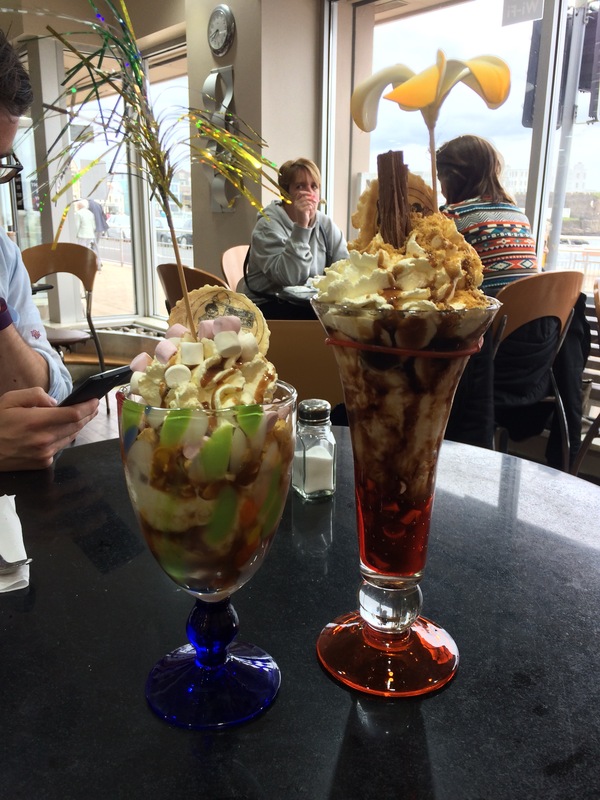 Next stop was Portstewart where the ice cream Sundays of Morellis on the promenade were too delicious looking to resist. These things were gigantic and after an absolute struggle I was defeated. It makes me sad just remembering that particular life failing *cry*. But I will be back here again and I will conquer one of them … someday (hopefully). Truthfully I have been neglecting reading for a couple of weeks now, just with being so busy I don’t have time to read during the day and before bed I have just been waaaay too tired. I plan to get right back into reading this month and I have had a trip to the library to temporarily refresh my book collection. There are two books which I am still reading; ‘Americanah’ by Chimamanda Ngozi Adichie and ‘Human’s of New York stories’. These are first on the list to be finished as I am enjoying both. ‘Confession of a Buddhist Atheist’ by Stephen Batchelor. This is a non-fiction book in which the author explains his own take on Buddhism and how he views both the buddha and the buddhist teachings. I am very interested in buddhism and this title really jumped out at me. Can’t wait to start this one. ‘The Cone-Gatherers’ by Robin Jenkins. This story is set during the war on a Scottish estate where two brothers work to help the war effort. They come across the gamekeeper when releasing rabbits from a snare and this gamekeeper commits some sort of heinous crime. Very intrigued. ‘After the Prophet’ by Lesley Hazleton. This is a factual book explaining the origins of the Sunni and Shia rift that is still present in Islam today. I am very interested to read this as I really like learning about the histories of religion. ‘Maps for Lost Lovers’ by Nadeem Aslam. This book tells the story of two lovers who go missing and the aftermath from their disappearance until twelve months later.